As early as in the next few weeks, an international tribunal in The Hague could announce whether China is operating within international legal norms as it builds up, and claims as Chinese territory, the Spratly Islands — a set of reefs, banks and cays jutting just above sea level a thousand miles from the Chinese mainland and within 200 miles of the southwestern Philippine province of Palawan. At stake are issues involving oil exploration, commercial fishing and control of shipping lanes. More strategically important are regional security implications. Chinese engineers have been dredging and expanding the Spratlys — creating land masses large enough to support airfields from which Chinese military aircraft could operate. Chinese representatives have declined to participate in the proceedings of the Permanent Court of Arbitration — calling the Philippines’ raising the matter with international arbitrators an undesirable “unilateral” action. The Chinese ambassador to Malaysia says the Philippine government’s actions have created “severe difficulties” in Chinese-Philippine relations. Amidst these tensions, another interesting uncertainty has been added to the equation. The people of the Philippines have elected a new president, surged into office on a wave of populist sentiment. Rodrigo Duterte, from the southern Philippine province of Davao, has promised to deal lethally with both street criminals and corrupt public officials — and to resolve the decades- (arguably centuries-) long civil strife between the Christian majority of the northern Philippines and Muslim communities in the nation’s south. Where Duterte stands with regard to relations with China is at present unclear. Early indications are that he may be amenable to a course different from that taken by his predecessor — which was a softly confrontational “let’s find a neutral arbitrator” tack, combined with agreements to allow U. S. military forces greater access to Philippine military bases, a number of them positioned facing the disputed island chain. Would Duterte reach a rapprochement with China at the expense of U. S.-Philippine military cooperation reinvigorated by the previous administration? One indicator that he will look to create a foreign and security policy balancing relations with China and the U. S. is his appointment of retired Major General Delfin Lorenzana as the nation’s 36th Secretary of National Defense. Lorenzana has resided in Washington for some years — serving first as a defense attache, then, in retirement, continuing to lobby U. S. leaders, semi-officially, on behalf of Filipino veterans of the Second World War, some of whom — for their service alongside U. S. service members, have been granted U. S. veterans benefits. 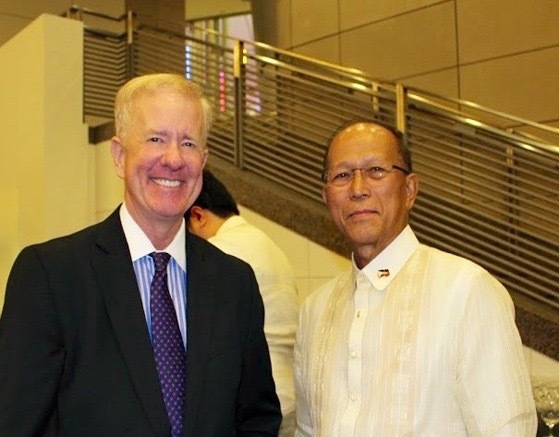 I spoke with Secretary Lorenzana in Washington June 9, days before he returned to the Philippines and his new post. He acknowledged the gravity of security issues facing his nation, but having yet to take part in a cabinet meeting with the new president, was able to offer little on any direction shifts in Philippine security policy, other than to reiterate his appreciation of what has for decades been a robust — if sometimes bumpy — history of U. S. and Philippine cooperation on security matters.